Knowledge – a new field of battle for whole countries, corporations, individuals. Today, we are increasingly confronted with situations that require us more knowledge for skilled work, and ultimately for survival. Having made the right choice of a university, a specialty, a level of education, you will provide yourself with a good prospect for the future. This is the purpose of the Center for Career Guidance and Pre-University Training (CP and DP), which has been operating since the beginning of 2010 under Osh TU. The center of pre-university training will help you in choosing your future specialty and will prepare you for the realization of your dream – successfully pass exams for admission to Osh TU, central universities of Russia, nationwide testing and regional olympiads. 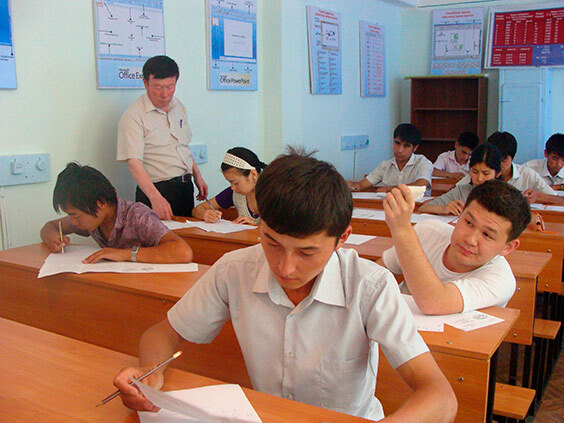 Students of the Central Committee and the DP Osh TU for the period of training are given a “ticket of the listener”, which gives the right to use the educational halls, the library, the Internet. Needy listeners are provided for the duration of their studies in the “Student’s Home”. During the school year, the Center for Career Guidance regularly hosts “Open Doors”, where you can get to know the university closely. Based on the agreement between our university and the Novosibirsk State Technical University (NSTU), the CP and DP organizes 3-month courses in testing subjects for those wishing to enter Russian Central Universities. Upon completion of the courses, the center invites representatives of the admission committee of the NSTU to receive admission examinations in Osh. This year, 9 entrants entered our various centers at various specialties of the NSTU (budget). All these students are successfully studying at the NSTU. Osh TU has 17 basic schools in the south of the republic. The university’s PPP and the center of pre-university training work closely with the teachers of the basic schools to improve the level of students’ preparation for the growing demands for a market economy, in the right orientation in choosing a future specialty. In order to identify gifted students, the CPiP conducts a school olympiad among the basic schools of Osh TU. Administration of the University from its funds encourages the winners of the Olympics and prepares them for further tests.